and tuna and mayo in the middle. it was really good! i also love how it was wrapped with kraft paper and sealed with blue washi tape. Totally going to make that. Look at you in all your cozy fall clothes! Your store has some wonderfully beautiful things in it right now, Renee. You have marvelous taste. wow, thanks! that's so nice of you to say. i love onigiri....when i was in japan with my brother, we would go to 7-11 and eat one every day! 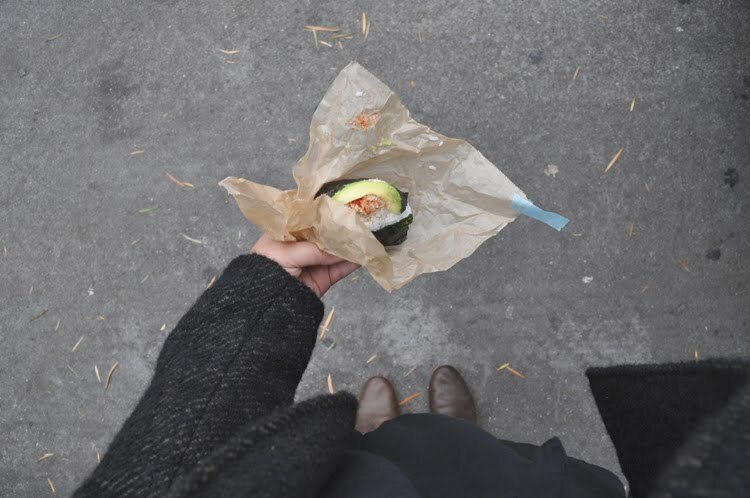 I love the cheap onigiri at the 7-11s, but where did you eat it? My friend and I felt absolutely rude standing outside, on the sidewalk, wolfing down our treats. Delicious! 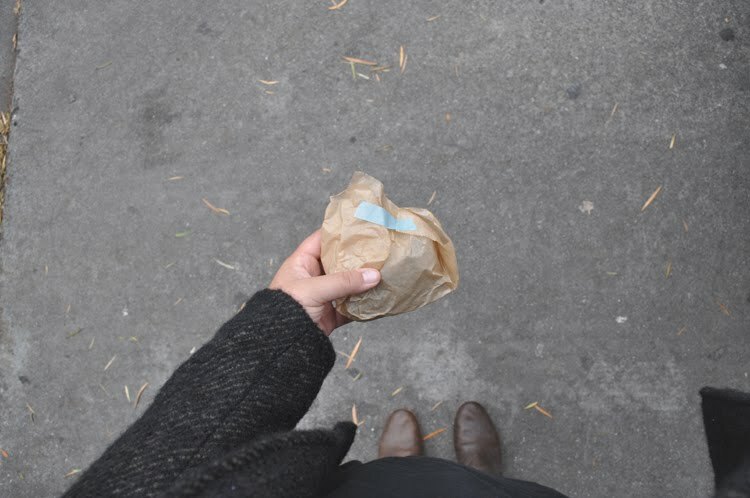 I love onigiri -- it's the perfect eat-on-the-go food. looks so delicious! the wrapping looks like you even wrapped it/your style, how perfect! hi jocy, joyce, and alexa! we stopped by the 7-11's in tokyo, hakone, nikko, and kyoto. we were always up early so we didn't have any problems eating outside. it's amazing how different the 7-11's are in japan. jocy, i love the photos you took at isetan by the way. the food looked incredibly good! Mmm! it looks and sounds so good. oh yum, that looks so delicious. i haven't found a good japanese market in toronto so far, but i'm definitely on the lookout for onigiri. oh onigiri is my favorite! especially that combo- i have always wanted to try making these myself, but haven't gotten around to it. where did you get this from? Yum Yum! I wish there would be a shop selling such goodies next to me! it's from yakini q cafe! i used to buy onigiri from nijiya market but they are so much tastier at yakini q.
that looks and sounds delicious. beautiful photos, beautiful blog. so glad i found you!